As the content (any words, images, video, audio) takes shape and nears completion, it can begin to be inserted into the website. 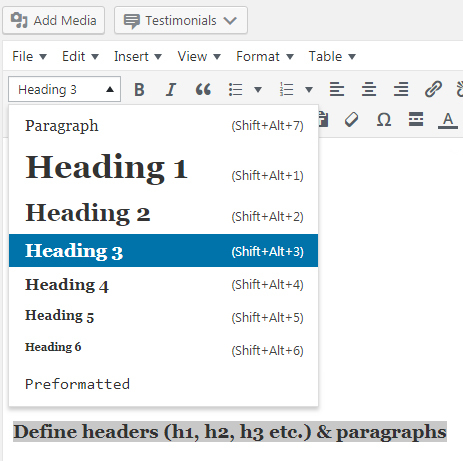 WordPress has a word processor and editor built directly into posts and pages, which can be easily previewed. In western culture, we read from left to right. On the web, we still read left to write with the addition that we’re scanning the page quickly, unless we’re particularly engaged and therefore hanging off every word. It’s wise to add plenty of line breaks at the end of sentences, by simply hitting the return button to start a new line. Headings and subheadings are given a label in the HTML code to denote size and importance. Headings help to organise text and made it easier to understand the flow of information. 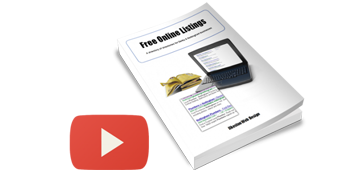 Web page titles need to be written and optimised for search engine results pages (SERPs). The titles show up as the blue, bold hyperlinks. These webpage titles are suggested to be a certain length and to include important keywords. Web page descriptions, like titles, need to be written (well, crafted, actually) because this is what entices a search engine user to click through to your site. Title tags are small text comments, aka tips, that appear when the user hovers their mouse cursor over a link. Here’s an example (hover over the link). It’s advised for ambiguous link names like “previous”, “next”, “click here”.